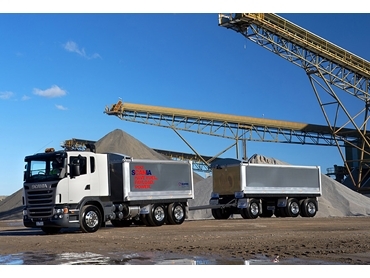 Scania introduces a new turnkey tipper-and-dog configuration for the resources industry. Supplied as a ready-built option, the tipper and dog combination features a Scania G 480 day cab and a large capacity tipper, pulling a 3-axle dog trailer. The powerful Scania G 480 features Scania’s fully automated (2-pedal) Opticruise gearchange system as well as the Scania Retarder for fuss-free braking. The 3-axle dog trailer combination has the flexibility to operate with or without PBS - there are PBS permits in place to allow the vehicle to operate with higher Gross Combination Mass using 3, 4, 5 or 6-axle PBS dog trailers. Scania tipper-and-dog combinations are aimed at the national fleets of resources management companies across Australia. Scania’s new tipper and dog solution features a cab-over configuration that provides improved visibility and manoeuvrability in on-site work, reducing the risk of damage to the front left corner of the vehicle. According to Scania National Fleet Manager, Steven Alberse, Scania is a very popular choice as a used purchase with owner/drivers of tipper-and-dog combinations because they appreciate the comfort and quietness of the Scania cab, while the cab-over configuration makes driving these vehicles more wieldy on-road, as well as on-site. Scania has identified a number of high profile fleets in the resources industry where the demonstrator vehicle will be placed to gauge their reaction. Scania is confident that the new tipper-and-dog will deliver fuel efficiency benefits, offer a more comfortable and pleasant working environment, and maximise uptime for operators with their Maintenance and Repair Programmes.